PLDT Group has collaborated with US-based global IT company Cisco as the Philippine telco leader moves to elevate the enterprise networking experience with next-generation business solutions powered with enterprise-class connectivity. The Group through its unit PLDT Enterprise and ICT subsidiary ePLDT, is collaborating with leading IT innovators to offer the most secure, visible and empowering business solutions to large businesses and small and medium enterprises (SMEs). Integrating these products with PLDT’s superior connectivity, enterprises can be equipped with sophisticated IT solutions to better manage their connectivity for their end-users, and enhanced IT security for their business. “Our collaboration with Cisco is just the first of many synergies we’re building to redefine the enterprise experience. PLDT is not just about giving fiber-fast connectivity, we aim to empower our enterprise customers with relevant, cutting-edge solutions that address today’s ever-changing and volatile business environment,” said SVP and Head of PLDT and Smart Enterprise Groups Jovy Hernandez. “As we come up with forward-looking solutions and market-attuned enhancements to our portfolio, we make sure that we have reliable partners who share our vision to empower the enterprise and can deliver the best-in-class products to enrich our voice, data and ICT solutions. Our ambition is to define the new standard in enterprise experience by leveraging on the value of secure, transparent, and empowering technologies - a service level our enterprise customers truly deserve,” he added. 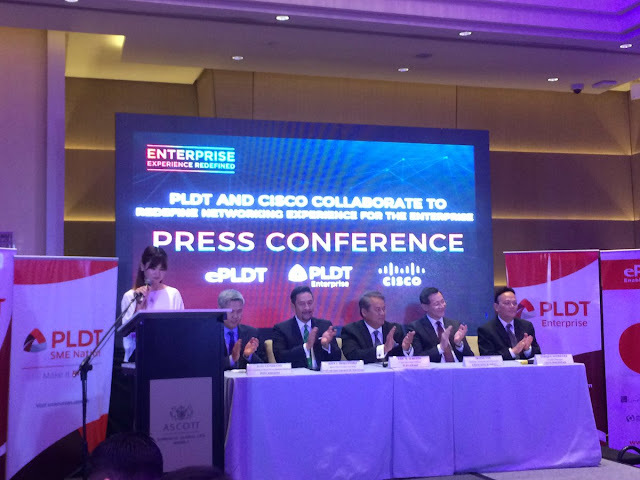 In line with the thrust of elevating the enterprise experience, PLDT’s initial collaboration with Cisco expands its portfolio of managed solutions by incorporating Cisco’s 4000 Series Integrated Service Routers to redefine wide-area networking, and catapulting branch connectivity performance to new heights by leveraging on Meraki, Cisco’s leading line of cloud controlled wifi, routing and security solutions. PLDT and Cisco also agreed to work hand in hand to foster enhanced collaboration and enforce greater network protection within the Philippine enterprise market, through its upcoming platform, which can provide an all-in-one collaboration solution ideal for businesses, and Umbrella, Cisco’s endpoint security portfolio. “Our continuous investments in future-proofing our network gives us a strong foundation which enables us to offer and expand our services with innovative technologies to better serve our customers both in the enterprise as well as in the consumer segment. The synergy arising out of our collaboration with Cisco allows our enterprise clients to enjoy greater value out of our combined strengths in the field of networking,” said PLDT Chief Revenue Officer and ePLDT President and CEO Eric R. Alberto.